Yes, you can grow a variety of crops YEAR ROUND in aquaponics in acclimatized greenhouses and if you install grow lights for use during winter months to extend the light of the day, you can grow both greens and blooming plants (tomatoes, peppers and cucumbers). However, there is a caveat, the ambient air temperature still determines which crops are easier to grow in cold weather or hot weather. For example, It’s easier to grow fragile greens in cooler weather. 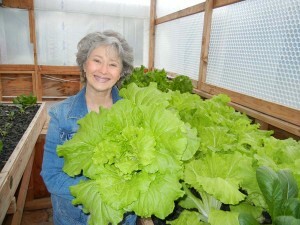 Let’s use bib lettuce, buttercrunch lettuce or red leaf lettuce as an example. If the air temperature is too hot, those lettuces will not grow to their maximum size, in fact, they may BOLT before they have even reached their average growth and are best grown in cooler temperatures. However, in hot seasons, there are far more heat-resistant lettuces available such as Romaine (cos). 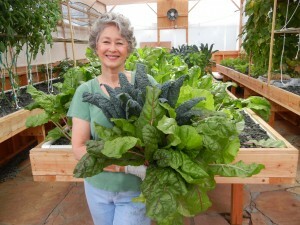 Komatsuna summerfest – An Asian Green we prefer over bib lettuce. Appropriate pH balance and appropriate nutrient levels. 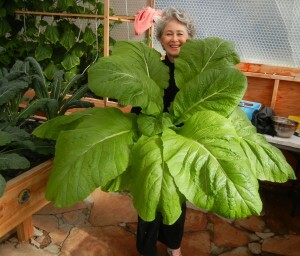 Phyllis Davis harvesting greens for a luncheon. That’s was one heck-of-a-salad. Yum. In order to create maximum crop yields, careful consideration is always paramount for seed variety and selection for growing at optimal levels by experimenting with small seed batches until you find a seed that offers maximum production in your farm. Before deciding on one particular seed or seed variety for your farm, experiment first. Since every area of the world offers a variety of seed choices in that country or region, take your time to speak with local growers and seed suppliers to see which seed will work best for you, in your climate, and then purchase a few different varieties of small packets of seeds to experiment in your aquaponics system until you find the seeds that work best for you and your family or future customers. All varieties of lettuces grow to harvest between 40 and 75 days and most lettuce seeds available for sale have been developed for growing hearty, healthy heads of lettuce in both cool weather and hot weather conditions. Phyllis Davis, Co-Inventor, holding ONE HEAD of India Mustard. Wow! That will make one gigantic salad! Head lettuces: Gulfstream, Vista, Oak Leaf, Great Lakes, Ithaca, Gator (highly recommended by University of West Virginia). Burpee, Igloo. Romaine Lettuces (cos): Snappy, Terrapin, Pomulus. Red Lettuces: Redfire and Red Sails.